The Daiwa CN-901HP cross-needle meter displays both forward and reflected power over a frequency range of 1.8-200 MHz in ranges of 20/200/2000 watts forward and supports peak reading. Accuracy is ±10% at full scale. SO-239 jacks. 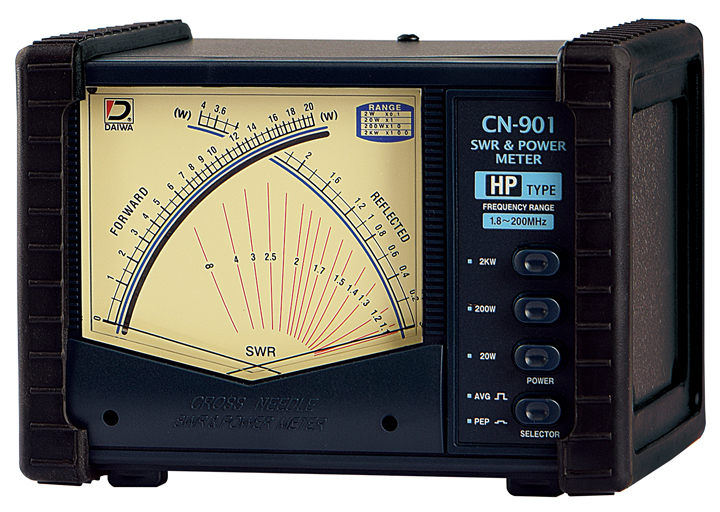 (Notice: Be especially careful to choose the correct power range on the CN-901HP/HP3). Please see other models in chart below. They look the same but have different frequency coverage and power capacities. SO-239 jacks are used for input and output . These meters feature a 13.8 VDC lamp terminal if illumination is desired and the CN-901HP requires 13.8 VDC for peak reading. Input impedance is 50 ohms. Size 6.25 x 4.3 x 4.8 inches.